Lawmakers begin their second day of hearings this week into the Internal Revenue Service’s actions in unfairly targeting conservative political groups for excessive scrutiny. Some of them are using the IRS’s missteps, as well as revelations Tuesday about Apple’s offshore tax shelters, as a reason to push ahead with a broader overhaul of the nation’s tax system. The problem is that while Americans increasingly see the tax system in need of repair, there is no consensus about its biggest shortcomings. 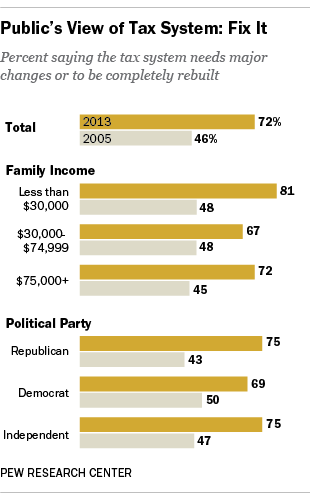 In a 2011 survey, there were huge differences in views between the rich and poor, and Republicans and Democrats, over where to start. A survey earlier this month, before the IRS reports surfaced, found an unusual level of public agreement that the tax system needs sweeping changes. Overall, 72% said the nation’s tax system either needs major changes (40%) or to be completely rebuilt (32%). Just 26% said the system works pretty well or needs minor changes. There’s a clear trend, too. The percentage saying the tax system needs at least major changes has risen 26 points since 2005, while the percentage saying it works pretty well has fallen 24 points. Most striking is that the rise among those who think the system needs major fixing has occurred across nearly all partisan and demographic groups. Yet our major 2011 study of opinions about taxes found little agreement on a basic question: What bothers you most about taxes — the large amount you pay in taxes, the complexity of the current system, or the feeling that some wealthy people get away with not paying their fair share? Surprisingly, relatively few people – just 11% – said their biggest complaint was the large amount they paid in taxes. Even among those with family incomes of $100,000 or more, only 17% said they were most bothered by how much they had to pay. Rather, most people (57%) were bothered by what they saw as the system’s basic unfairness – “the feeling that some wealthy people get away with not paying their fair share.” Only about half as many – 28% – pointed to the tax system’s complexity. This survey was conducted before this year’s fiscal cliff agreement, which raised taxes on most Americans and hit wealthy people with new, higher rates on income and investments. Still, it would take a major shift in attitudes for the public to say that the complexity of the tax system – and not its fundamental fairness – is the most bothersome thing about taxes.